Promotional Products | Visions Inc.
Get your brand recognized with the most effective and economical marketing tools available today. You can’t ignore these facts! What other marketing tool gives you lasting exposure while generating business? These giveaways are ideal for customer gifts, trade shows, employee recognition, new customer acquisition, fundraising, as well as brand awareness. If you’re looking for a proven way to increase sales, Visions can help. 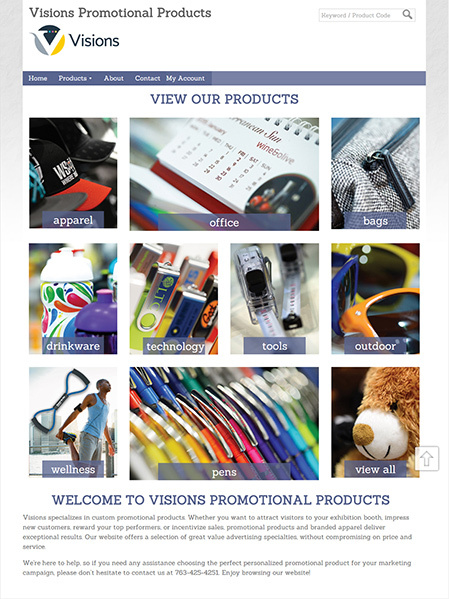 Check out our new promotional products website at www.VisionsPM.com or call us at 763-425-4251.